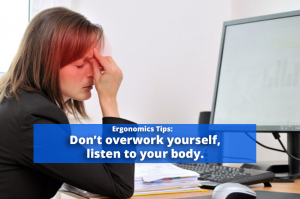 Don’t Overwork Yourself, Listen to Your Body - Solutions Northwest, Inc. According to BYLLP, the Top 5 Work Related Injuries are caused by: Overexertion, Slip and Fall Injuries, Equipment Injury, Motor Vehicle Injury, and Repetitive Motion Injuries. Our clients at SolutionsNW.com frequently tell us they’ve developed musculoskeletal disorders by pushing themselves too hard. Commonly, the injury is from repetitive motion related to work tasks. Repetitive tasks require us to do the same movements over and over again. It especially becomes a problem when we ignore our body’s warning signals of pain. Our body starts sending stronger and stronger warning signals until we finally pay attention. When we start paying attention we regret letting the pain get to the point it is at. This is why we need to pay attention to our bodies. Our health should be our number one priority because without it we have nothing. A lot of times we cannot physically do as much as we want to or feel we have to. We just have to find a way to be at peace with that. Things we want to accomplish will get done eventually, it may just take longer than we would like. Rest your eyes with these Eye Exercises. Always stay hydrated with these simple tips. Make your workstation a little more ergonomically friendly with these tips. And always consider the RICE method of rest, ice, compression, and elevation for injury relief.